Steven John "Steve" Carell (/kəˈrɛl/; born August 16, 1962) is an American actor, comedian, director, producer and writer. After a five-year stint on The Daily Show with Jon Stewart, Carell found greater fame for playing Michael Scott on the American version of The Office, on which he also worked as an occasional writer and director. He has also starred in lead roles in the films, The 40-Year-Old Virgin (2005), Evan Almighty (2007), Get Smart (2008), Crazy, Stupid, Love (2011), The Incredible Burt Wonderstone and The Way, Way Back (both 2013). He has also voiced characters in the animated films, Over the Hedge (2006), Horton Hears a Who! (2008), Despicable Me (2010), Despicable Me 2 (2013) and Minions (2015). 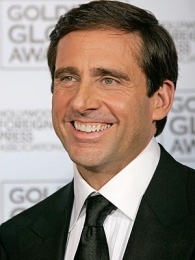 Carell was nominated as "America's funniest man" in Life magazine, and received a Golden Globe Award Best Actor in a Television Series for his work on The Office. His dramatic role as wrestling coach and convicted murderer John Eleuthère du Pont in the 2014 film Foxcatcher earned him several awards and nominations, including a nomination for the Academy Award for Best Actor. He also received acclaim for his roles in Little Miss Sunshine (2006) and The Big Short (2015), the latter of which earned him a Golden Globe nomination. Born into an Italian-American family in Concord, Massachusetts, USA. He was educated at The Fenn School, an all boys private school in Concord, Massachusetts, then at Middlesex School in Concord. He studied and graduated from Denison University in Granville, Ohio, then took acting at Chicago's Second City troupe. Carell made his film debut in 1991, as Tesio in Curly Sue (1991). From 1990-1996 he taught improvisational comedy class and also performed with The Second City troupe in Chicago. During the 1990s he was writing for The Dana Carvey Show, then he had a stint as one of correspondents on The Daily Show with Jon Stewart. Carell shot to fame after his breakout performances as Evan Baxter opposite 'Jim Carrey' in Bruce Almighty (2003) and as Uncle Arthur opposite 'Nicole Kidman' and 'Will Ferrell' in Bewitched (2005). He co-wrote the original screenplay for the summer box-office hit The 40 Year Old Virgin (2005) which was chosen as one of the Top Ten movies of 2006 by the American Film Institute. At the same time he appeared in Little Miss Sunshine (2006), an independent dark comedy that gives an unusually sharp and sarcastic view on America. In 2007 Carell reprized his role as Evan Baxer, filling Jim Carrey's leading-man shoes as a politician asked by God to build a giant ark in Evan Almighty (2007), the second installment of the Almighty franchise, co-starring Lauren Graham and 'Morgan Freeman'. In 2008 he re-united with 'Jim Carrey' in highly successful animation hit Horton Hears a Who! (2008), then appeared as Agent Maxwell Smart in popular comedy Get Smart (2008). Carell has been enjoying a happy family life with his wife, actress 'Nancy Carell', whom he met when she was a student in an improv class he was teaching at The Second City comedy troupe in Chicago. The couple have two children, daughter Elisabeth (born May 2001), and son John (born June 2004). Carell is living with his family in Los Angeles, California. Graduate of Denison University, which is in Granville, Ohio. He and 'Jim Carrey' (qv) were both ice hockey goalies in their childhood. Has the rare distinction of being in two movies that opened on the same day in the U.S. - _Anchorman: The Legend of Ron Burgundy (2004)_ (qv) and _Sleepover (2004)_ (qv) (July 9, 2004). Of Italian descent. His father, Edwin Caroselli, changed his name to Carell before Steven was born. Daughter Elisabeth Anne born in May 2001. He was nominated for a 1994 Joseph Jefferson Award for Actor in a Revue for "Are You Now or Have You Ever Been Mellow?" at the Second City Theatre in Chicago, Illinois. He was nominated for a 1993 Joseph Jefferson Award for Actor in a Revue for "Truth, Justice, or the American Way" at the Second City Theatre in Chicago, Illinois. He auditioned to be on the British version of Whose Line is it Anyway. Mike Myers also auditioned for it but both were unsuccessful.